Based on reviews from 11 experts and 156 users. Learn how our rankings work or see our guide to Puma Future football boots. Updated Apr 2019. Puma has been competing ever since it was founded by Adolf Dassler in the 1940s. A brand that was created out of sibling rivalry proved to be not all bad - for fans of the beautiful sport, that is. Innovation after innovation sprouted from this legendary brand. For one, Puma football boots were the first ones to introduce the concept of interchangeable studs on cleats for soft ground courts. Since then, the brand has not stopped pushing towards progress in the football arena, coming up with a slew of technologies that have been firsts in football boot construction. As this long-standing brand progressed through the years, there have been some standout models that have been the brainchild of the well-known German brand, especially from their Puma Future football boot collection. Here are some of the notable models that have been part of the collection which pushed the brand towards innovation excellence. The Puma Future 18. 1 Netfit football boot features the brand’s unique Netfit technology. Affording the ability to create a personalized fit, the Netfit allows the player a virtually endless array of possibilities in lacing combinations. Using a mesh-based material that tops the main Evoknit upper, the holes of the mesh element act as eyelets for the laces. The knit construction underneath the mesh element of this Puma Future football boot creates a sock-like sensation, adding support and a barefoot feel for players on the field. The colorway used is quite unique as it manages to create a cohesive look through vastly different hues. Using a yellow, red, and black color scheme, this model manages to create a ghostly vibe and at the same time a menacing air. The upper is mostly yellow which slowly transitions to a black heel area. Red accents are found in the medial part of the shoe as well as the internal part of the football boot. As a second generation release from the Puma Future collection, there have been some definite updates found in the Puma Future 2.1 Netfit football boot compared to its predecessor, the Puma Future 18.1 Netfit. Perhaps the most apparent change is found in the midfoot area where a softer material is used in its construction. Reinforcement in terms of inner heel padding while the merged top layer is removed. As evident in the name, Netfit technology has been used in this shoe’s construction as well as an Evoknit collar. This allows for a more sock-like fit and support during play. The unique lacing system, on the other hand, allows for a more customizable fit for the shoe. A hugely limited edition release, the Puma Future 18.1 Netfit Next combines the classic elements of the Puma Future football boot collection and the brand’s Netfit technology. Sporting a colorway reminiscent of the grassy terrain of colossal football arenas, this Puma Future football boot model colorway comprises a green gecko, yellow, and white color palette. The whole shoe sports a gradated look starting with a fully white forefoot which slowly transitions to a green hue from the heel area to the collar. The Puma logo, however, still manages to stand out with its yellow coloring. Several notable players including Joel Latibeaudiere, Allan Saint-Maximin, Dortmund's Mahmoud Dahoud, Giovani Lo Celso, Torino's Simone Edera, and Koya Kitagawa sport this reptilian-looking Puma Future football boot. Over the years, the Puma brand has not let down patrons in creating quality football cleats. Part and parcel of the brand’s identity have been the ability to push the sport forward through football boot innovations. This is precisely why the organization has remained relevant through the years. With this, here are some of the notable technologies that the brand has brought into fruition especially for their Puma Future football boot silo. As one of the breakthrough technologies of the Puma brand in recent years, Netfit technology has been introduced to the majority of the brand’s football boot models. This technology aims to create a more personalized fit for the players of the beautiful game as it allows for a virtually infinite number of lacing combinations. This is made possible through its mesh-based upper. Using the mesh material’s holes to thread the laces in by virtue of personal preference brings another level of customizability for the users of Puma Future football boots. 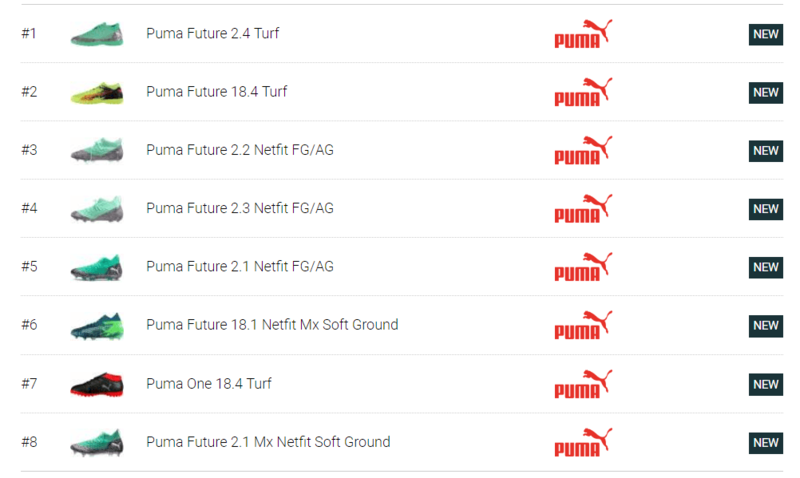 Notable Puma Future football boot models with this type of technology include the Puma Future 18.1 Netfit, Puma Future 2.3 Netfit FG/AG, and the Puma Future 2.2 Netfit FG/AG. Keeping up with the knit-based trend, Puma created their own brand of knit-based technology for football boots. Aimed to create a more lightweight and sock-like feel to their football boots, Evoknit has been incorporated into a number of the brand’s football boot models including the PUMA Future 18.1 and the Puma Future 2.3 Netfit FG/AG. A well-known material used for a speedy experience on the pitch, a Pebax outsole is unsurprisingly common among modern Puma Future football boots. This material has been engineered to be lightweight and durable at the same time. This elastomer also amps up responsiveness to the player’s movement during play while maintaining flexibility. 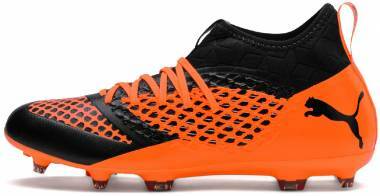 Examples of Puma Future football boots with this outsole are the Puma Future 18.1 football boots. A combo of lightweight materials and a specialized stud pattern, Puma Future football boots with this technology incorporates a mix of conical and bladed studs for a hyperreactive ride on the pitch. 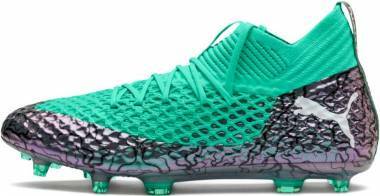 A Puma Future football boot with this type of outsole includes the Puma Future 18.1 Netfit FG/AG, Puma Future Netfit FG/AG, and the Puma Future 18.1 Netfit FG/AG. While football boot specifications are hugely important in the selection of football cleats, it’s hard to deny that the look of a football boot matters just as much. A soccer shoe’s colorway has as much to do with a shoe’s demand as well as the technologies used in its construction. The color specifications of a boot allow the player to express one’s personality on the pitch; might it be that of a more traditional player opting for the classic black and white color scheme, or one looking to stand out on the pitch with the use of more garish hues. With this, here are some of the notable color packs from the Puma Future football boot silo. Sporting the hues of spring, the Puma Frenzy pack features a stand-out colorway on the pitch. Featuring a Deep Lagoon, Puma White, and Green Gecko color scheme, football boot models with this colorway are also the first ones to include the brand’s Netfit lacing system. Professional footballers including Antoine Griezman and Marco Reus sported the pair in the 2018 World Cup. A Puma Future football boot with this colorway includes the Puma Future 18.1. 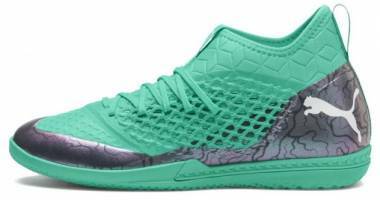 The model incorporates a solid Deep Lagoon color in the forefoot area which transitions to a Gecko Green heel area. The collar is also sprayed with the blue-green hue while sporting a white Puma logo at the center of the collar. Underneath the Netfit material, a white Puma logo is splayed across the medial side of the shoe. As expected from the name, the Camouflage pack features an array of different hues of green. Firstly, the upper of the Puma Future One 1 Netfit from the Camouflage silo is created with a textile material which conforms to the shape of the wearer’s foot allowing for optimal ball control. The Netfit material also mixes different shades of green as well as the laces. The soleplate makes use of a camo pattern and is constructed from a lightweight Pebax material. This Puma Future football boot colorway’s release date is on November 2018. A colorway created for the 2018 World Cup, the Illuminate color palette has been applied to two of the brand’s contemporary football boot collections including the Puma One football boot silo and, of course, the Puma Future football boot collection. 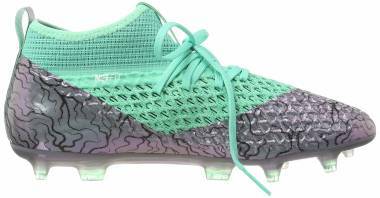 Found on the Puma Future 2.1 football boot model, the colors used are those of iridescent teal and grey. Majority of the upper is composed with that of the blue-green hue with blocks of grey in the heel area. The logo detailing is colored in white which is placed in the pull-tab and the heel area. Looking reptilian with its white and green colorway, the incredibly limited edition Puma Future 18.1 On/ Off football boot graces the foot of well-known footballers including the Allan Saint-Maximin, Mahmoud Dahuod, Giovani Lo Celso, Joel Latibeaudiere, Simone Edera, and Koya Kitagawa. The scaly-looking cleat includes a mostly white forefoot with an emerald green heel area which is brought into cohesion through gradation. This model has also been specked with a Gray Violet detailing most evident in the heel area and the model’s pull tab. This colorway debuted on May 3, 2018, with only 350 pairs made for global distribution. Making use of an almost blinding color palette, the Puma Future Uprising looks fiery on the pitch with the use of a shocking orange and a black color scheme. Created for the 2018 World Cup, the upper is composed of a mostly tangerine hue which slowly transitions to the more darker hues-from red, to an ultimately black lower forefront area. The collar is also colored in black with an orange logo detailing. The soleplate, however, sports an orange hue. 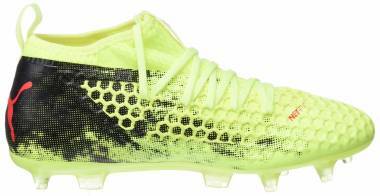 A Puma Future football boot with this type of colorway includes the Puma Future 2.1. Essentially a blackout colorway, the Puma Future Eclipse is a special edition release for the Puma Future Netfit 18 football boot model. Worn by Marco Reus and Antione Griezman, this all-black colorway features all the standard Puma Future technologies from its Netfit lacing system to the lightweight Pebax soleplate. As expected from any modern football boot, different models are created to suit different court types. Puma Future football boots are no different. Below are the court types that Puma Future football boots are created for. A recent development in football cleats, multi-functional soleplates that are created to bring traction on firm ground and artificial grass courts have been integrated into Puma Future football boots. The Puma brand mostly meshes this type of soleplate with their Rapidagility technology. Utilizing a Pebax-based soleplate makes use of a mix of bladed and conical studs to deliver traction on both firm ground and artificial grass courts while being durable and lightweight. Puma Future football boots with this type of soleplate include the Puma Future 18.2 Netfit FG/AG, and the Puma Future 2.4 FG/AG. Made for the small-sided game, Indoor football boots are created to cater to indoor or street surfaces. This type of soleplate is designed to work on flat surfaces. 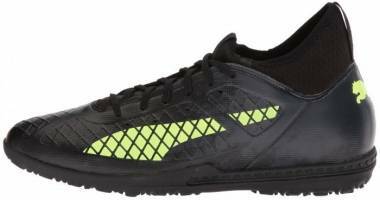 Puma Future football boots for this type of court makes use of gum rubber material which allows for grip, especially for gyms and arenas. Puma Future football boots with this type of outsole include the Puma Future 18.4 Indoor Trainers, Puma Future 2.4 Indoor, and the Puma Future 2.3 Netfit Indoor. Soft ground football boots are made during the winter months. When courts are expected to be filled with mud, soft ground football boots allows the player the ability to change out studs to avoid being weighed down by mud. Changing studs out involves screwing them into the cleat’s soleplate. 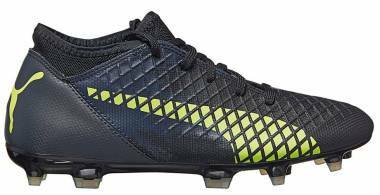 Puma Future football boots with this soleplate type include the Puma Future 18.4 Soft Ground, Puma Future 18.1 Netfit Mx Soft Ground, and the Puma Future 2.1 Mx Netfit Soft Ground. Firm ground courts feature short natural grass. This court type can be slightly wet underfoot while feeling firm. The studs commonly used for this type of surface includes a conical and/ or bladed studs which pushes for acceleration and optimized traction. Puma Future football boots with this type of soleplate include Puma Future 18.1 Firm Ground Netfit and the Puma Future 18.4 Firm Ground. Also called Astro turf, turf football courts are constructed with two types of materials: synthetic grass and sand which is placed underneath the grass. Coarser than natural grass, football boots for this court-type are constructed to withstand a harsher surface. 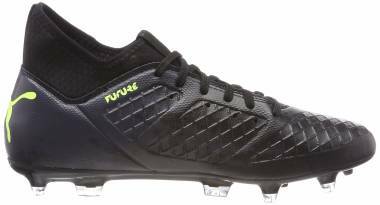 The stud configuration of football boots for turf courts includes a solid rubber-based outsole with several small studs that are oriented in several different directions. Puma Future football boots created for turf courts include the Puma Future 2.4 Turf and the Puma Future 18.4 Turf. A stud type which is most closely associated with Nike, multi-ground type stud patterns have been adapted by other major football brands as well including Adidas and Umbro. Puma Future football boots have also applied this stud configuration into this silo’s construction. This stud pattern is designed to bring traction on a number of court types including artificial grass, firm ground, turf, soft ground and indoor settings. This stud pattern creates optimal grip for different surfaces while minimizing the amount of discomfort for the player’s foot. This is achieved by a more equal distribution of pressure across the foot. The Puma Future football boots with this type of of soleplate includes the Puma Future 18.2 Netfit Multi-ground and the Puma Future 18.4 Multi-Ground. How does an FG/AG football boot work? While the FG/AG soleplate has been pioneered by the three stripes, other brands including Puma has been quick to catch up with their own brand of FG/AG Future football boots as well as for their other silos. Claiming to work in both firm ground and artificial grass courts, this soleplate type has been subject to much heated debates about its viability. There have been mixed reviews about this issue, however, the bottomline from most expert football boot reviewers is that football boots should be worn on the court type that they are designed for to avoid unwanted injuries during play. Should I choose a football boot according to my player position? While a number of brands seem to propagate the idea of football boots according to a player’s position on the pitch, several football boot enthusiasts have disproved this idea. Several have pointed out that one’s football boot does not determine a footballer’s performance. While a decent football cleat can aid player experience, the footwear does not necessarily make for a better shot, power, and/ or speed. The most important aspect, it seems, in football boot selection is personal preference. Does Puma Future have low top, mid top and high top football boots? Most of the football boots from the Puma Future football boot silo includes two collar types which are mid top and low top collars. Each collar type brings its own set of benefits to the player. Firstly, for low top collars, they bring a more traditional feel for the wearer. It is commonly paired with a lacing system to create more support and lock-down for the shoe. This collar type is usually preferred by an older type of demographic. Puma Future football boots with this type of collar includes the Puma Future 18.4 Indoor Trainers and the Puma Future 2.4 Indoor. A relatively new feature for football boots, mid top football boots are designed to bring optimal support for players. Extending up to the ankle area, this collar type wraps around the area, bringing a more secure fit and support. Mid top football boots can either be paired with a lacing system or not depending on the cleat model. Puma Future football boots with this collar type includes the Puma Future 18.1 Firm Ground Netfit and the Puma Future 18.3 FG/AG.